The Additional Tasks dialog displays 3 options. If checked, these options will be performed after the installation. 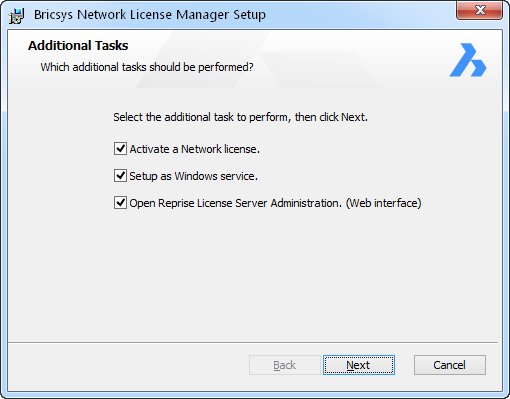 After the installation, opens the Bricsys Network License Manager , asking you to activate a Network license. 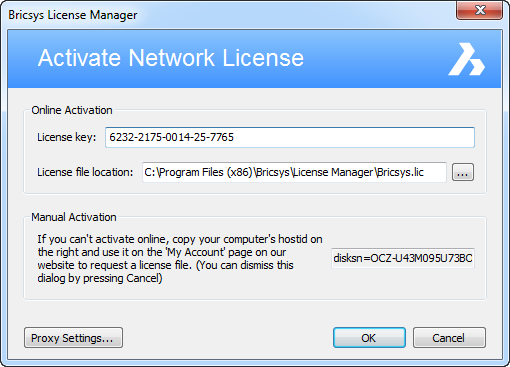 You can later open the Bricsys Network License Manager by clicking the License activation shortcut in the Start menu. Each time you start Windows, the license server will be automatically started as a service. After the installation, open the Reprise License Server Administration web interface where you can manage all about the network license. You can later open the Reprise License Server Administration by clicking the License Server Administration shortcut in the Start menu. By default, these 3 options are disabled when installing via the command line. See Installation from the command line. In the Additional Tasks dialog, all options should be checked. In the Start menu, click the License activation shortcut to open the Bricsys License Manager . In the Bricsys License Manager , enter the new network license, then click the OK button. In the Start menu, click the License server administration shortcut to open the Reprise License Server Administration . In the Reprise License Server Administration , click the Reread/restart servers option in the left menu. Download and install the Bricsys Network License Manager on the computer is used as network license server. In the Additional Tasks dialog, all options should be unchecked. The installation restarts the license server. The Network License Manager can be installed from the command line. By default, options Activate a Network license , Setup as Windows service and Open Reprise License Server Administration (Web interface) are disabled when installing via the command line. To enable these options, use the respective parameters ACTIVATELICENSE , INSTALLSERVICE and OPENWEBINTERFACE . For example, msiexec /qb /i Bricsys-NetworkLicenseManager.msi ACTIVATELICENSE=1 INSTALLSERVICE=1 will just show the activation dialog and install as a service without showing the web interface. For more options, type: msiexec /? at the command prompt. On the Microsoft website, you can find more information about the msiexec command. The Network license must be activated on the license server. If your computer is not connected to the Internet, activation can be done manually via another computer (which is connected to the Internet). See Activate a Network license manually. 1. In the Start menu, click the License Activation shortcut. The Activate Network License dialog box opens. 2. In the License key field, enter your Network license. 3. In the License file location field, the location of the license file must be the Bricsys Network License Manager installation folder. Network licenses cannot be deactivated. The Network license server is automatically started/restarted after the installation. However, you can start it manually if necessary. In the Start menu, click the License Server shortcut. The server is now started and can be now configured via the Network License Server Administration. With a Network license, you have the ability to allow a floating license to roam to a system which will subsequently be disconnected from the network. The resulting license can be used for the number of days specified when the license was set to roam, and is checked back in automatically at the end of this time. In addition, you can return the roamed license back to the license pool early if this is desired. The license file(s) on the network license server contain(s) a parameter max_roam_count. This is set to the total number of seats on a network license by default. See also Roaming on the client side.